For Dallas residents, one benefit of having the Super Bowl in town, was learning from the national media about great things in our own backyard. 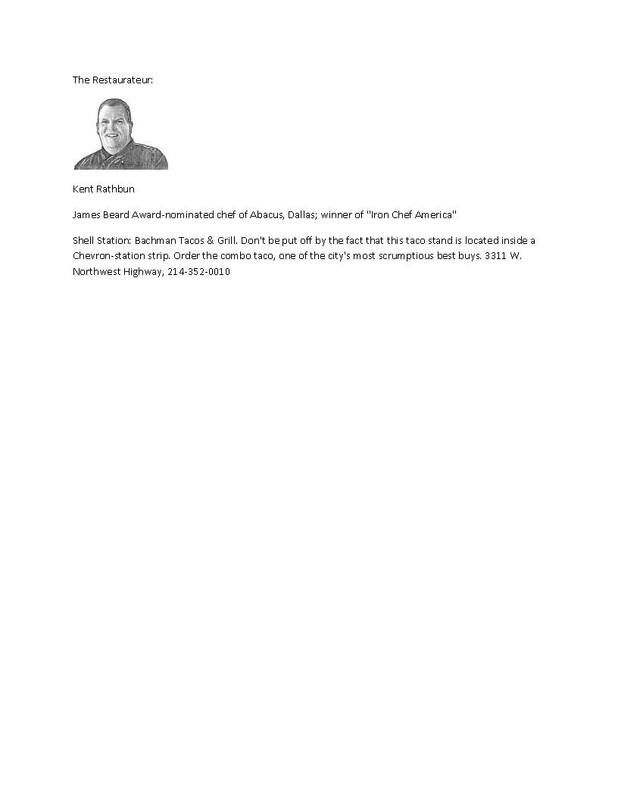 In one recent Wall Street Journal article, lauded Dallas chef Kent Rathbun (Abacus and Iron Chef America) said his favorite tacos in town were at Bachman Tacos, located inside a Chevron station in a working-class area of town. I first checked it out about a month ago, and have been back several times, taking coworkers and family members. Do you think I like it? Yes; it reminds me of days gone by when I’ve eaten tacos and burritos from street vendors in Mexico. The first three were outstanding, with trompo topping the list. The beef is not something I’d order again; it just didn’t taste good to me. I rarely eat meat, eggs or dairy that isn’t from a local farmer I’ve met personally, but there’s just something about these tacos that I make an exception. If you try them, I’d love to hear what you think. Buen provecho!